WWE made a blockbuster announcement this week as Kurt Angle will have his final match on Smackdown Live. Without a shadow of a doubt, the match could be the highlight of this week. The former WWE Champion is facing the Phenomenal One, AJ Styles. Earlier, Angle announced that he will be hanging up his boots after the Show of Shows in New Jersey. 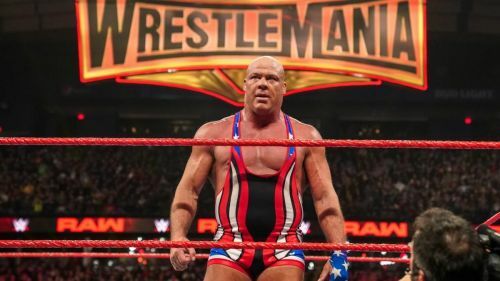 The WWE Universe expected an elite opponent for the Olympic Gold Medalist at WrestleMania 35, but Angle stunned the fans when he announced Baron Corbin as his final opponent. Considering the stature of Corbin, he is not a suitable candidate to retire a legendary superstar. Therefore, it will be interesting to see if we get to see a twist in the next two weeks. Following a substandard run last year, Angle has gained momentum in the recent weeks. The Olympic Gold medalist defeated Apollo Crews and Chad Gable in the last two weeks. Angle's opponent on Smackdown Live is AJ Styles, who is set for a remarkable bout at the Show of Shows. The Phenomenal One will fight Randy Orton at Metlife Stadium. Angle's final match on Smackdown Live could have immense significance. Here we discuss three ways the match could end this week. Considering AJ Styles and Kurt Angle are building good momentum before WrestleMania, it will be hard for either of the two superstars to lose cleanly. However, it is the final match of Kurt Angle on Smackdown Live, and he might earn a clean victory over the Phenomenal One. The Olympic Gold medalist offered some memorable bouts on Smackdown Live as he was an essential member of the blue brand in his prime. Hence, it will be a great send-off if he earns a clean victory in his last match. While it is not a suitable result for Styles before the Showcase of Immortals, Styles' opponent Randy Orton also got pinned in the Gauntlet match last week.